The alert was radioed to the Warden, Mark Jenkins, who, with the help of visitors and Rangers, managed to overpower the calf and confine her for the night until an air rescue to Nairobi could be arranged the next day. She was sedated for the flight, and upon regaining consciousness in Nairobi, was extremely traumatized and wild. 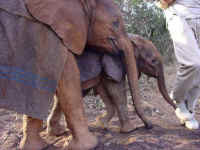 The other Nursery elephants were put in with her to calm her down, which they did, literally within hours, but it was difficult at first to persuade her to accept milk from a bottle. It was also necessary to keep the calf enclosed in one of the rhino stockades for several days, because she was prone to running off on her own in a bid to escape, but within just a few days, she was part of the "gang", although depressed and obviously grieving for her lost elephant family for several months afterwards, which is normal with an orphan of this age. She was named "Mulika", a place within the Park near which she was found, and although extremely emaciated and dehydrated upon arrival, with the help of homeopathy and colloidal silver, we were able to circumvent the usual diarrheoa and other "lurgies" that often manifest themselves following trauma and stress. Mulika is therefore one of the very few orphans that have never needed the attentions of the Vet, other than for the initial travel sedation. Since then, she has slowly become happier, and will now play in the mudbath, although not yet as exuberantly as the others. She is a loving and gentle little character, and her best friend is "Nasalot" who sleeps in the next door stable to her at night.